A proper geek needs a proper computer, so let me show you what I have bought and collected over the years. 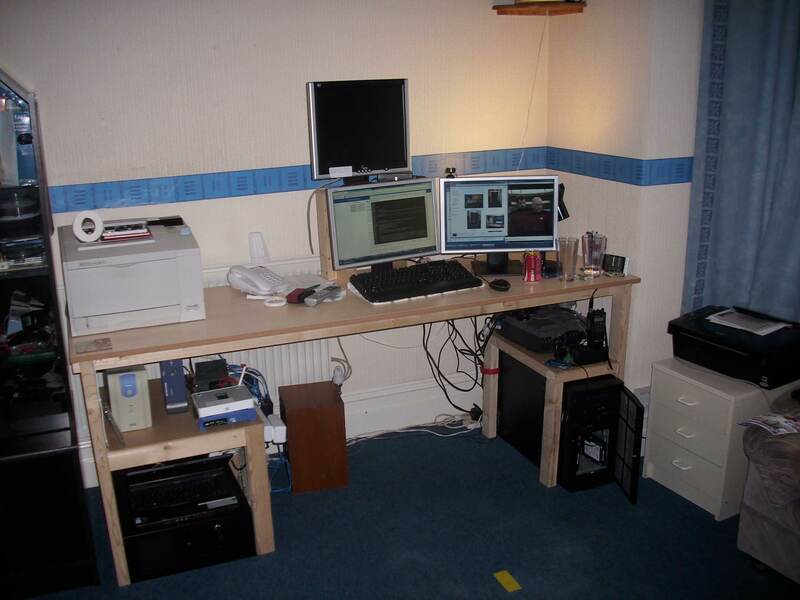 When I moved into my flat I needed a desk suitable for my personal needs. A ready built desk was not suitable as it did not offer what I needed. Instead I went to B&Q and bought some 2x4 wood, some contiboard and got to work. Below is the result. It has a section for each of the equipment I needed it to. These were pretty top specs for it's time and it's still a very nice PC to have even now in 2011. It's still fast, stable and plays all of the games I need it to. It too me around a month to spec up a computer I knew I was going to have for the next few years, so I took that process slowly and carefully, with the aid of a friend who ran and worked in his own computer shop with his father. 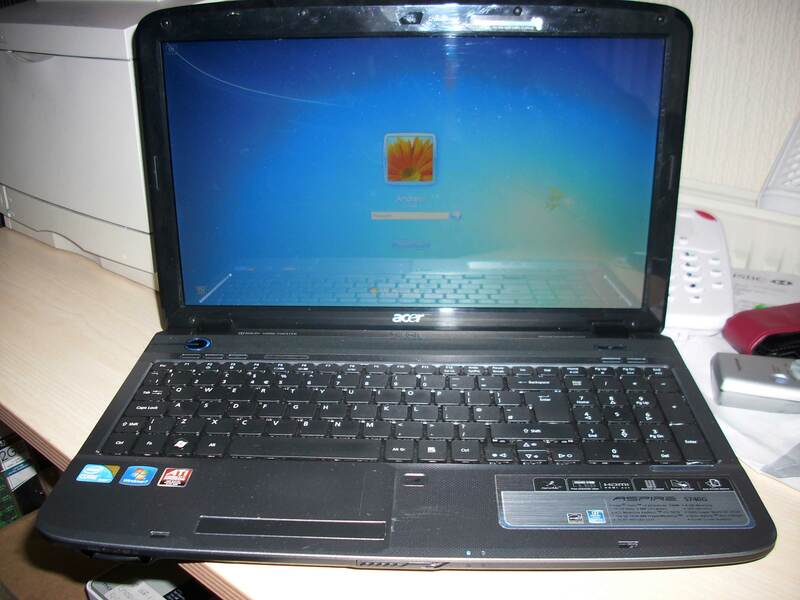 He helped me decide the best specs for the price and where to compromise and improve upon. What you see above is the outcome of that hard work. RAID0 is a brilliant invention. 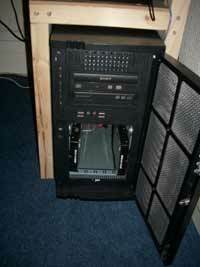 It allows you to combine one or more drives to make one large drive. By having two drives, you write 50% of the data to each. This allows double the read/write speed. Since the hard drive speed is the limiting factor in just about any computer these days, the faster you can get the better. Just as you can write to two drives at 50% each, you can write 33% to 3 drives and triple the speed. The performance gains stop after 4 drives or so, and the possibility of drive failure doubles each time you add a drive. In RAID0, if you lose a drive, you lose all of your data because there is no parity. To be able to lose a drive and still recover, you need RAID 5. 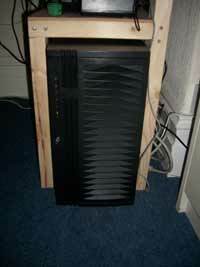 A single drive on it's own may reach about 60-70MB/s sustained read/write. This isn't really enough for tasks such as uncompressed screen capture during games. 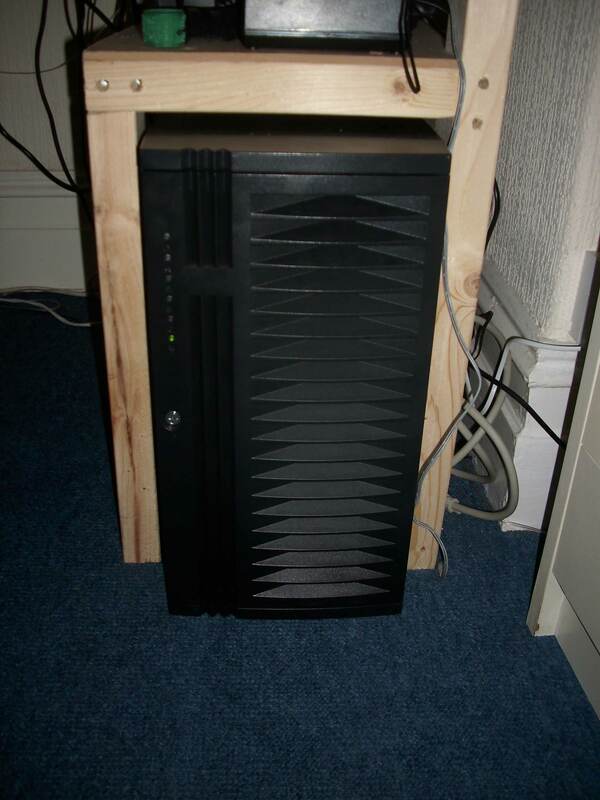 For that you need to guarantee you can sustain 40MB/s or so. While in game there will be plenty of texture loading etc which saps away some of the speed, and a fragmented hard drive won't help either. I chose RAID0 for this reason as well. The performance of this laptop is amazing. Even after a year of use it still doesn't fault or experience any slow down and it's used on a daily basis. The Core i3 processor has never reached full load because it has so much excess power. Even when gaming I've never seen it reach full. Speaking of gaming, the gaming performance is fairly good too but it doesn't match up with desktop specs. Mobility graphics is far less powerful than desktop graphics. Still, it plays everything I want it to, including one of my favourite games, Left 4 Dead 2. I originally bought my netbook after my previous laptop broke and I couldn't afford a full sized replacement. Instead I bought this for £200. I have to say, it has performed admirably and served brilliantly as a full time computer for a few months after I moved. 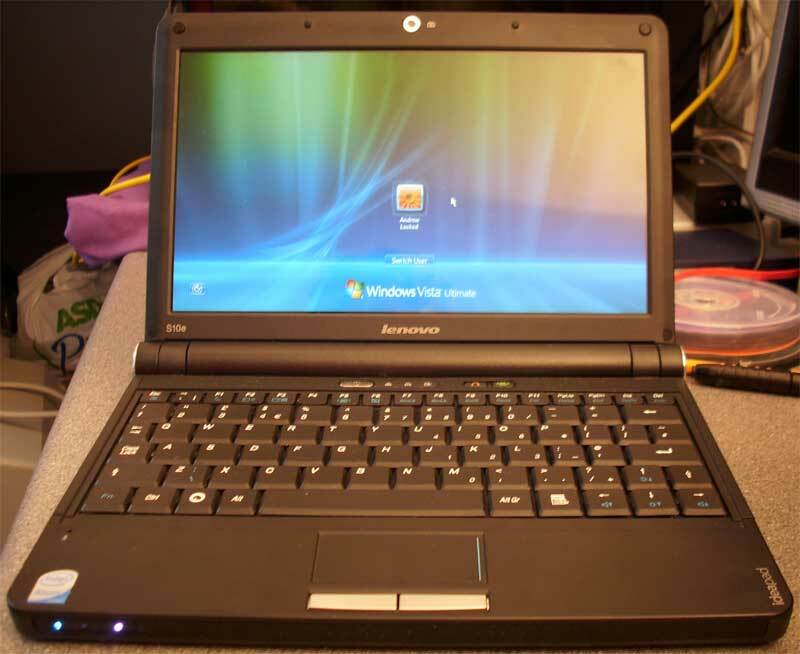 For such a "low power" laptop (or netbook if you will), it still has enough power to run Windows Vista and Windows 7. This did surprise me as it originally came with a cut down version of Linux. It does take it's time on some tasks but it was more than powerful enough to do basic Photoshop work and run a browser and IM client. 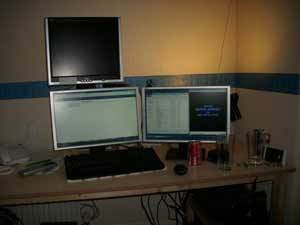 As I said above, I actually used it as a full time computer for several months while I was unable to set up my desktop PC. It never faulted once and combined with a USB modem it makes for a great mobile browser with it's huge battery life.